The negative impact of volatility on market returns is well-known to quantitative traders but maybe not well understood by investors. where G is the geometric return, A is the mean arithmetic return, or the average of the daily returns of an asset, and V is the variance of returns. It is clear from Eq. (1) that for constant arithmetic return A, the geometric return decreases as the variance V increases. Note that Eq. (1) is a linear approximation of the function G = f(A,V). BU tin many cases and for all practical purposes, there is no need to use a better approximation. Below is a chart of SPY since inception. The indicator pane shows a histogram of daily arithmetic returns. Note that the actual annualized return of SPY from inception to 05/19/2016 is 8.8308%. Therefore, Eq. (1) underestimates the actual annualized return by nearly +28 basis points. Whether the difference is positive or negative may in general depend on the relative magnitudes of A and V.
When volatility increases, the annualized return is negatively affected. This is one reason that fund managers worry about rising volatility. It may be seen from the above chart that after a period of low volatility from 2012 to the end of 2014, there has been an uptrend in the magnitude of daily fluctuations due to the uncertainty about the future direction of the market. In turn, this uncertainty causes volatility negatively affects performance by lowering the annualized return and the Sharpe ratio. As already mentioned, Eq. (1) is a linear approximation. There are some more complicated formulas. In the table below I compare the results of four formulas. It may be seen that based on the actual annualized return of SPY, which is equal to 8.8303% from inception to 05/19/2016, the results of all four formulas are the same within a few tenths of a basis point. For all practical purposes then, the simple linear approximation is good enough in this case. Finally, it is often heard that high volatility benefits traders. This is false because high volatility increases trader risk and limits returns due to a smaller position size. 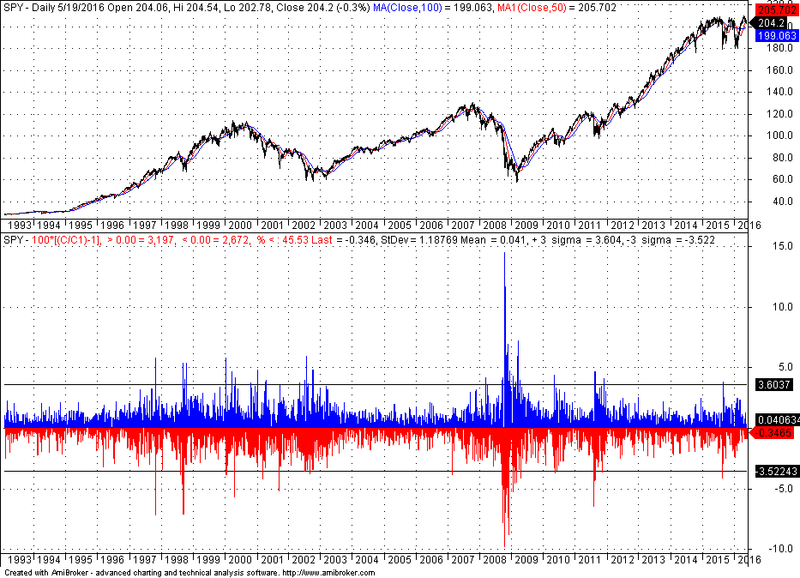 Only traders who are long volatility benefit but they are a small percentage of the total.